Marvel’s superheroes just can’t stop fighting each other lately, whether it’s on the big screen or in the comic books. But it turns out that not even their animated adventures on Disney XD can escape the allure of hero versus hero action—and we’ve got an exclusive clip of the superhero scrap breaking out. This weekend, Avengers: Ultron Revolution will air four back-to-back episodes that will form its own take on Civil War. It’s a sort of mash-up between some of the characters from the recent Captain America movie, the events of the original Civil War comic, and even a dash of Inhumans á la Civil War II, as the Avengers (Captain America, Black Widow, Hawkeye, Hulk, Thor, Falcon, and Iron Man) and the Mighty Avengers (Captain Marvel, Ms. Marvel, Black Panther, Red Hulk, Vision, Songbird, and Ant-Man) find themselves on opposite sides of the law. Here’s a full synopsis for the event, as well as an exclusive clip of Hawkeye taking the fight to the Mighty Avengers as an all-out war begins. When one Inhuman is overwhelmed by his powers and destroys a small town, the US government steps in and passes the Registration Act – a piece of legislation that requires all Inhumans to publicize their superpower. When the Avengers disagree with this new law and refuse to enforce it, Truman Marsh decides to enlist the Mighty Avengers instead. Unfortunately, with these two teams fighting in a civil war, no one expects Ultron to make his final move. 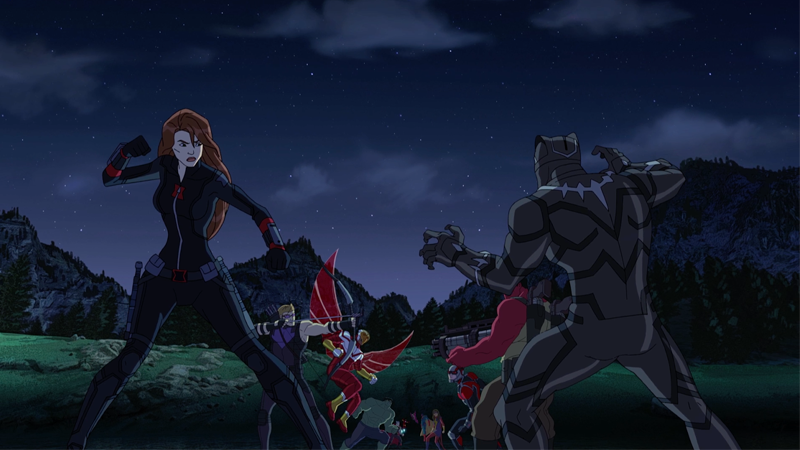 Avengers: Ultron Revolution’s four-part Civil War event will air this Saturday, January 28, on Disney XD.